If your account is part of a Google G Suite, suggestions for others at your company will appear as you type. If suggestions do not show, your administrator needs to configure G Suite settings to enable API access, contact sharing, and external directory sharing of domain and public data. Instead of having to enter email addresses, you can also share a Coda doc with a link! You can now share using a link with people outside of your organization, and even choose different access levels for your coworkers than for everyone else. You can then click the dropdown menu next to each option and select the sharing level that seems right. For people outside of your domain, you'll see one different option for read-only access, Can view or play. This is a great option for templates or apps you build using your Coda docs. Interested in templates? See more on this later in the article. Do you know that feeling when you've built out your doc as powerful as an app, and really want to share it with the world? Enter Coda's Play mode. When you share a link with people using the Can view or play option, viewers can see (and interact with!) Coda docs without ever signing up for Coda. The best part? They can explore your doc (or template) to their heart's content, without saving any of their changes to it. Just make sure your Anyone with a link option is NOT set to No Access. 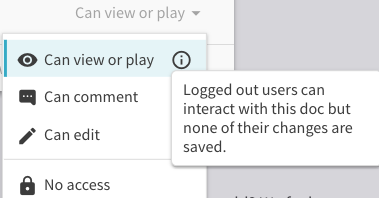 Viewers then won't be able to edit or comment on your doc while logged out of Coda. You can also embed your Coda doc on your website, blog, wiki or pretty much anywhere else. Just click the Embed button in the Share menu, and copy the embed code to paste onto your website. Keep in mind, viewers will still be able to play with the doc, see the section list and view open comments by clicking the Open in Coda button. When sharing your doc, you can also choose which section the viewer should land on by default. This option works for all types of sharing, including email, links and embeds. The section you are currently viewing is the one selected by default. When viewing a View Only doc, you can also select to Copy the doc which is a great option for creating template docs and letting your team reuse them by creating copies.